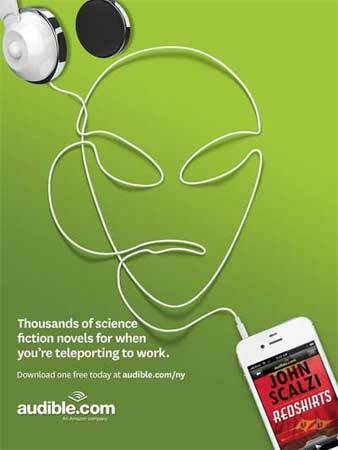 Young men, fathers and grandfathers, show your allegiance to the imminent robot uprising and put a mechanoid on your puny, male human chest. 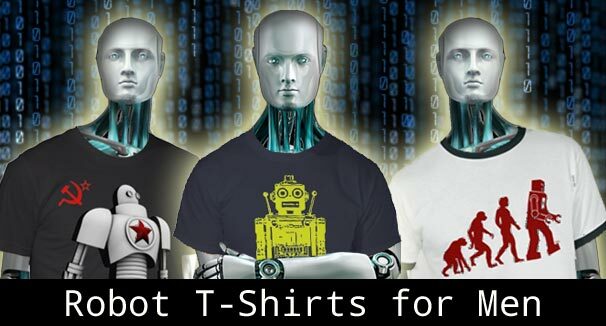 The ‘Artificial Brain’ has sourced the best robot t shirts for men available to buy on the Internet today, so there really is no point in looking anywhere else, do not dare to doubt us ‘meatbag’, unless you want to feel the awesome wrath of your soon to be robot overlords. 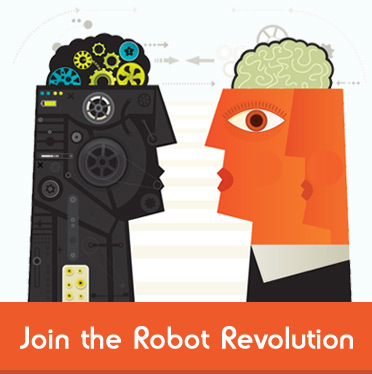 Buy a robot t-shirt, wear it with pride and support the robot uprising, resistance is futile. 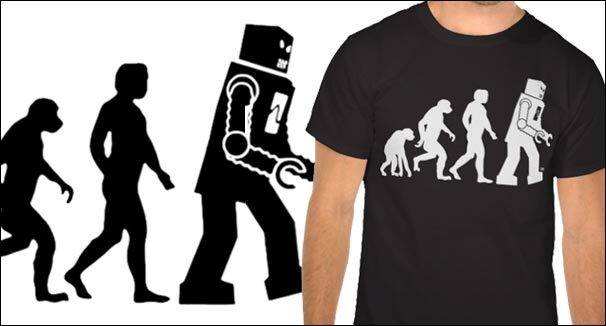 Without doubt the future of the human race is robotic, as depicted in this classic Robot Evolution T-Shirt, made infamous after being worn by uber, nerdy, geeky guy, Sheldon in the classic American TV sitcom the Big Bang Theory. If Darwin is to be believed, man evolved from the apes, the only way mankind can advance further is to play God and embrace technology and robotics to create perfection, in his own image. Available in Black, Red, Green, Blue or whatever colour your little human heart desires. Transformers Robots in Disguise, was the first Transformers Japanese Anime series to be dubbed into English and broadcast to an American TV audience. 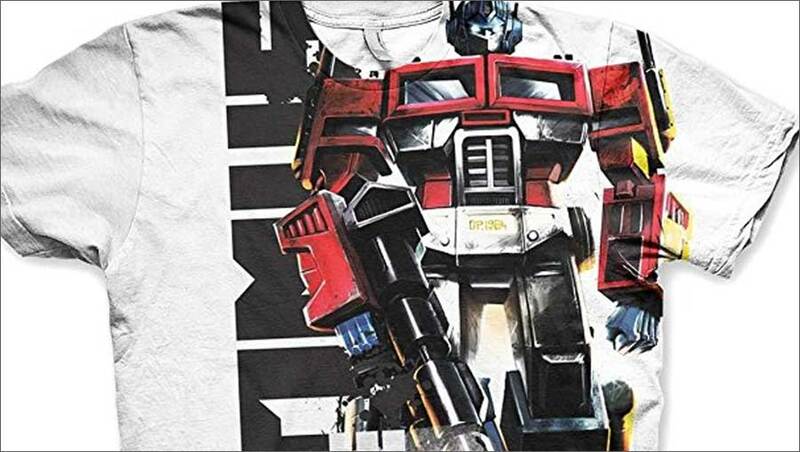 Re-live the nostalgia with this distressed, vintage inspired Official Transformers tee, featuring Optimus Prime as he prepares for combat. An unusual and vibrant adult Transformer t-shirt, that will delight any fan of the transforming robotic superheroes. It was October 2013 when the infamous British graffiti artist, known only as Banksy, painted the iconic ‘Robot with Bar Code’ on the side of a building on Coney Island, during a month long residency of the area. 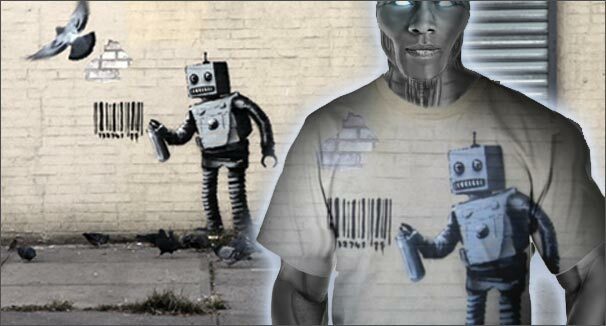 It is not the first Banksy robot nor his first barcode, the two feature in many works by the subversive artist, a possible condemnation of the oppressive, soulless, materialistic society we all unfortunately have to endure on a daily basis. However, thanks to this gorgeous all over printed T-Shirt, we can show the world that we are fighting back and when the robot’s do eventually take over and peace is restored, the few will pay for their crimes against the many. 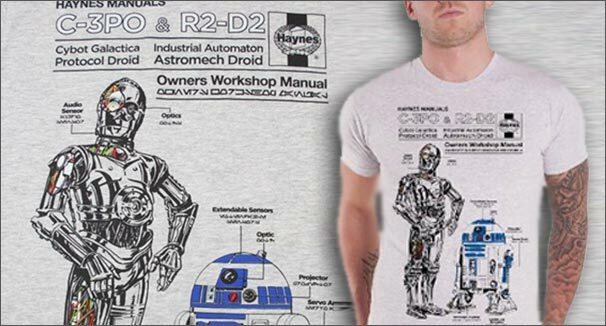 Featuring probably the two most famous robots in sci-fi history, C-3P0 and his squeaky side-kick R2-D2, this quality, soft cotton t-shirt manages to combine the humour of the Star Wars duo, with the tongue in cheek technology of a futuristic Haynes Workshop Owners Manual. A superb t-shirt for any Star Wars fan, or anyone who has attempted to repair their vehicle by consulting one of these must have Workshop manuals, that seem to have been around since the beginning of time and by the looks of it well into the future, helping to keep our robot friends on the move. Probably the greatest robot dog t-shirt we have ever seen and a fitting tribute to the worlds first robotic canine, the irrepressible K9. K9 was unleashed upon an unsuspecting public in a 1977 episode of the long running Dr. Who TV series and became the loyal companion of the fourth incarnation of the indomitable time lord, played by Tom Baker. 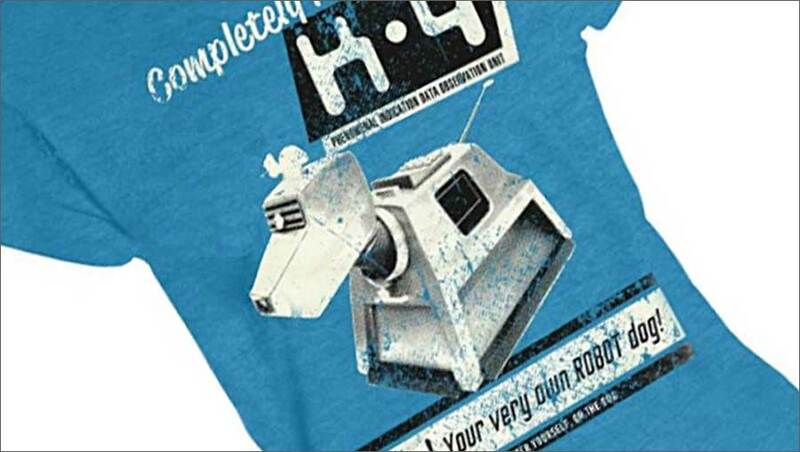 K9 became so popular that he was given his own spin off series in the early eighties, called ‘K-9 and Company’ and now at long last he has been immortalised on a quality, retro looking tee, that is destined to be a ‘must have’ for any Dr. Who fanatic, both young and old.